Our Personalized Tag Necklace is a perfect way to incorporate a special saying, or all your family's names onto one beautiful pendant. A rectangular tag is engraved with your desired inscription up to 3 lines, 12 characters each line. In the special instructions box below note if you also want a heart or star shaped design added in. Tag is 21mm high x 11mm wide x .75mm thick. 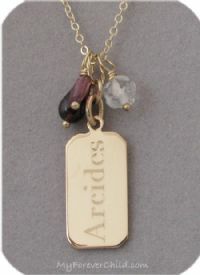 This Personalized Tag necklace is available in Sterling Silver and 14K Gold Filled. Comes with a chain, select desired length below. 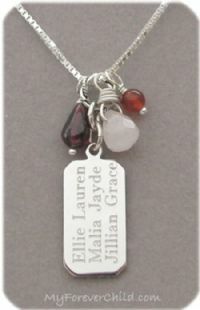 Click Here to add genuine gemstone dangles on to your Personalized Tag Necklace.